One of my favorite crafting tools is Mod Podge. When I open the bottle of Mod Podge, suddenly I'm once again a happy girl in the craft hut at summer camp, decoupaging the artwork from a greeting card onto a wooden plaque. Good times. 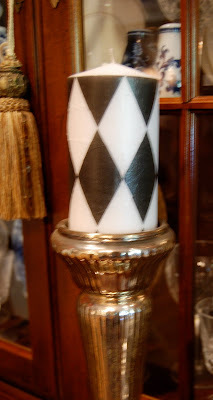 I got the idea to decoupage candles from one of my favorite bloggers, Manuela at The Pleasures of Homemaking. If you'd like to see how I make my candles, you can read about them here. Up to now, I've made all my decoupaged candles with napkins. I've taken pretty paper napkins and decoupaged them onto plain pillar candles. But now that autumn is approaching (thank goodness), I wanted something a bit warmer and chunkier--a little more fallish, if you know what I mean. The solution? I added a bit of raffia to each candle just for fun. I'm happy with the finished product--I think they look very fallish! If you want to see lots of cool Mod Podge creations, visit the CSI Project this week! And to see what everyone's been up to this week, check out the Weekend Bloggy Reading link-up over at Amanda's! Love what you have done, great idea for fall. I love the burlap around the candles. May have to borrow that one! Those are so pretty and "fallish", but doesn't the burlap catch on fire. Forgive me if that's a stupid question. I need Crafting for Dummies. That's a good question, not stupid at all! 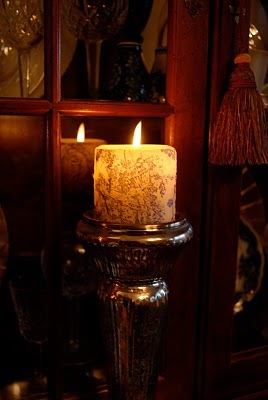 I only decoupage the sides, not the top, and I only decoupage pillar candles, so that the paper or fabric is far away from the flame. I've burned my other decoupaged candles quite a bit, and the flame has never come anywhere near the sides. It sort of burns a "well" down into the center of the candle. I gotta dig out my scrap pieces of burlap and give this a try. Yours look great! Burlap on a candle = A great idea!! I'll be that we start to see these all over blogland! Very Fallish indeed! Love it. What a fabulous idea! I absolutely love it! You're so smart! I never even though of MP for candles and the burlap....brilliant! Love it! I think I might have to copy this. Love it! I HAVE to know where you got your toile napkins! There's a BH&G project with red toile napkins, but I have no idea where to find them! Definitely cute and "fallish". Loving your chalkboard plate as well!! you always leave the sweetest comments for me! looking forward to finding a spare few minutes to mod podge some candles. thanks for sharing yours with us. & did your plumber ever show up? Love your candles. The burlap is rather fallish, without hitting you on the head with a pumpkin ... not that I don't really super duper love a pumpkin, cause I do! I may have to try this lovely trick with the napkins. Does it work with tissue paper too? Yes, Laura, you can use tissue paper--in fact, the black and white harlequin candles pictured above were made with tissue paper.